Grand Central Publishing, 9780446178280, 288pp. For the past 30 years, Barbara Corcoran has built a business and a career on knowing where we will live before we even know it ourselves. She's sold her business for an astounding price, has penned a best-selling memoir, and is the national media's go-to person for real estate trends and news. In NEXTVILLE, she turns her keen eye toward predicting "the next big things" in real estate for Boomers as they begin to reach retirement. Barbara identifies the top 8 trends that are changing where (and how) Boomers are retiring--whether it's pursuing passions, living green, finding community, living young in a city or college town, or even staying right in your old home town. Corcoran delivers her signature "Barb's Rules" for choosing real estate that no one can afford to miss. These 77 million Americans born between 1946 and 1964 -- who are turning 60 this year at a rate of 8,000+ per day -- are healthier and wealthier than their parents were. And according to a recent study, 60% of these Boomers plan to move to a new home in the next 10 years. zBut most of these folks aren't going to head to a condo in Boca like Grandma did. This group is looking for other options and their location will reflect their passions. Barbara Corcoran will name the places where readers can make the best investment today to ensure a secure, comfortable, and fabulously fun tomorrow. Now in this updated paperback edition, Barbara Corcoran discusses how to survive...and profit from the economic downturn. 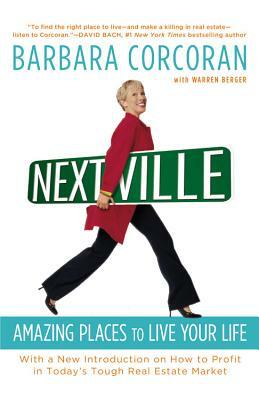 Barbara Corcoran is the author of the national bestseller Use What You've Got. She founded the successful Corcoran Group real estate company and was CEO until she sold it in 2005. Corcoran is president of the television production and business consulting company Barbara Corcoran Inc. She is currently the weekly real estate contributor to NBC's Today show, is regularly featured on MSNBC and CNBC, and she writes a weekly column in the New York Daily News. Corcoran lives in New York City with her husband, Bill and their two children. "If you want to make a killing off the next big thing in real estate, or if you just want to find the right place to retire, listen to Barbara Corcoran-she'll help you figure it all out while making you smile too!" "...illuminates real estate retirement trends..."
interviews, citing real people and real places as examples." "Whether you're just toying with the idea of moving, considering a second home, or seriously ready to relocate, don't make a final decision without first reading this book. The truth is, NEXTVILLE is about far more than where to live. It's about living your life to the fullest."